JL4229A is a highly integrated multimedia controller targeted for Digital Photo Frame with digital LCD panel through LVDS interface. It is capable of reading/playing the photo (JPEG), video (Motion JPEG), and audio (MP3/WMA) from memory cards and internal NAND Flash. All of your favorite digital photos can be played back in slide show or in still display while MP3/WMA music is playing back. There are various slide transition effect are added between each photo slide. All of above playback doesn’t need the use of PC. It can read/write the files from/to different kinds of memory card such as USB Pen Drive, CF/Microdrive, SD/SDHC, MMC/MMCplus, XD, and NAND Flash. 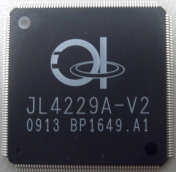 Besides photo frame function, JL4229A can be used as USB Card Reader thru USB Device port (MassStorage).